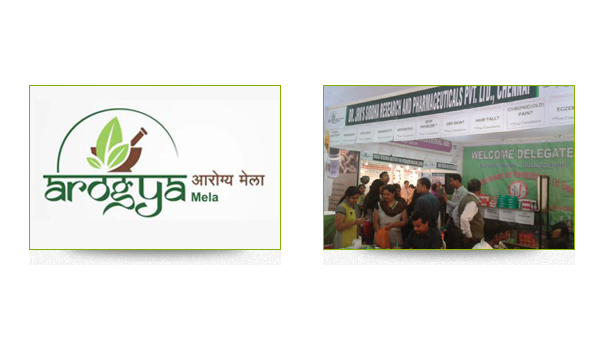 Dr.JRK’s Research Participated in Arogya Mela 2019 held at Patna, Bihar on 22nd Feb – 24th Feb. 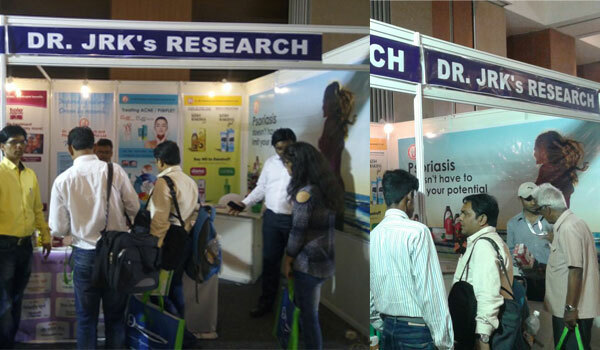 The benefits of our products were highlighted to participating Doctors and the general public by our East zone Team. We look forward to more such events in the future. 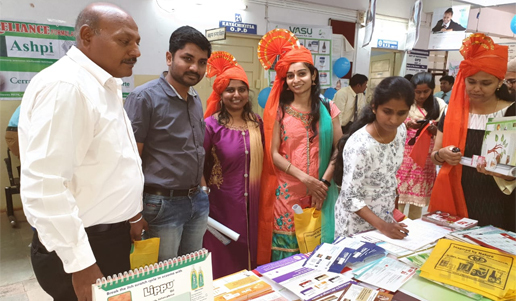 Dr.JRK’s Research conducted a CME programme for the National Integrated Medical Association – Ballari District, Karnataka on 24th Feb 2019. The topic “Scientific Development in Herbal Medicine” was presented by Mr.Aravamudhan – Our Head of Business Development South Zone. 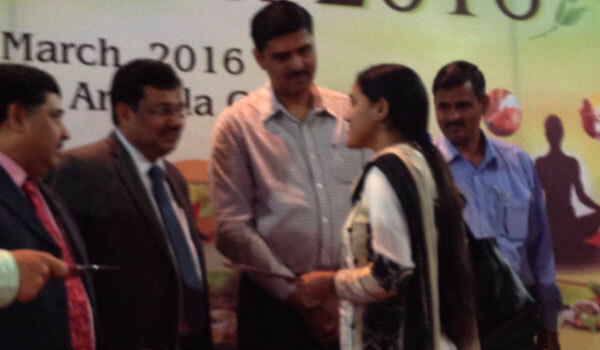 HUBLI AYURVEDA SEVA SAMITHI'S Ayurveda Mahavidyalaya and Hospital Alumni Association conducted the state level CME program as a mark of annual meet on February 10th 2019 for which around 300 delegates participated. 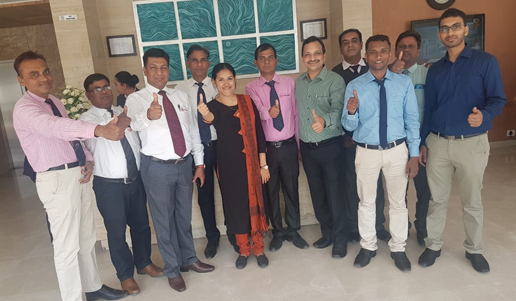 A 2 day training programme on Product knowledge, Selling skills and In-clinic performance was conducted at Ahmedabad for our central and west sales team. 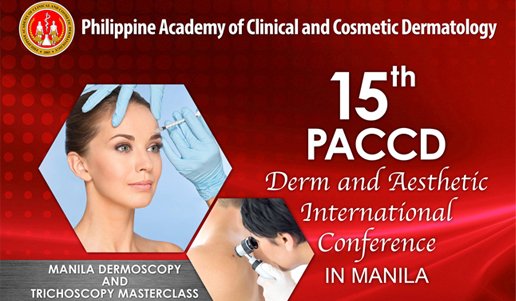 Dr. JRK's Research participated through its associates in the 15th PACCD ( Philippine Academy of Clinical and Cosmetic Dermatology) Derm and Aesthetic International Conference in Manila between 4th and 6th October 2018. M/S. 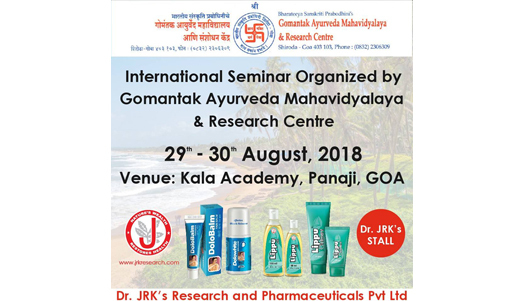 Gomantak Ayurveda Mahavidyalaya and Research Centre celebrates Silver Jubilee Year, organising International Conference on 29th & 30th Aug 2018 @ Kala Academy Panaji. Goa. 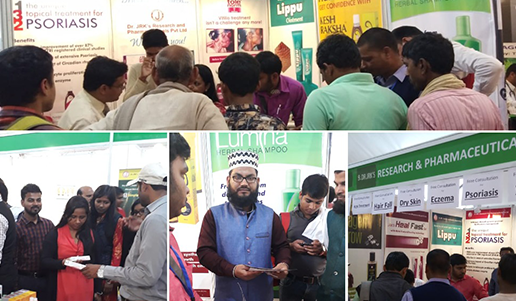 Ayurveda Parva’18 - National Ayurvedic Conference organized by All India Ayurvedic Congress and its state partner Bihar State Ayurvedic Congress at Patna. FEB-12 Unani day celebrations, Kolkata, West Bengal. 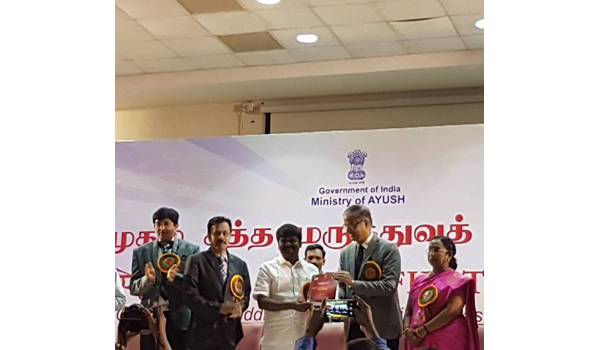 4th January 2018 was celebrated as SIDDHA DAY by the Ministry of AYUSH and a function was organised by the Central Council for Research in Siddha (CCRS) Chennai. 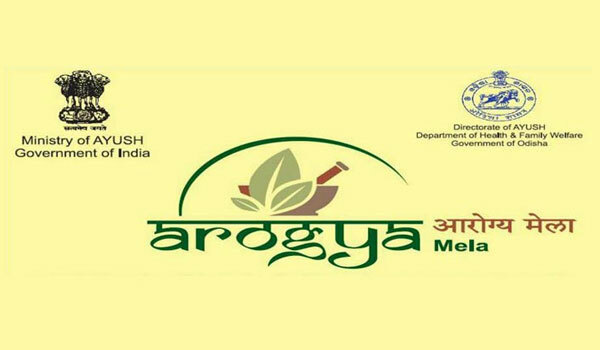 Honb'le Minister for AYUSH Shri Shripad Yasso Naik and Dr. Rajesh Kotecha Secretary Ayush} during the official inauguration of the 1st International Arogya 2017 at Vigyan Bhawan Delhi. 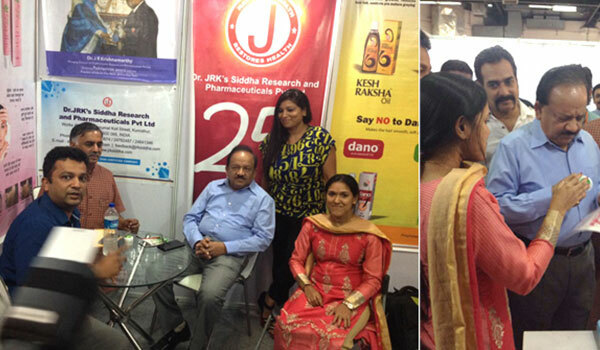 Dr. Harsh Vardhan, Union Minister of Science & Technology, Earth Sciences, visited our stall in Delhi YOGSHALA exhibition and appreciated our products. 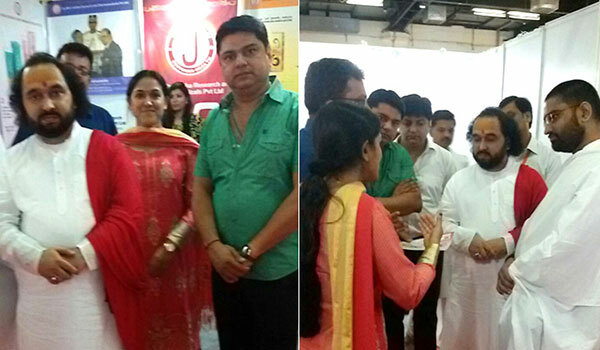 His Holiness “Acharya Jagdishji Maharaj” of Namo Gange Trust and organisers of YOGSALA exhibition visited our stall in Delhi YOGSHALA exhibition celebrated from 21st to 23rd june. 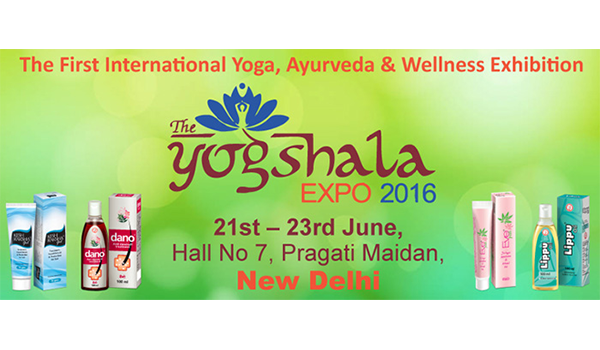 Visit Dr.JRK’s stall at The First International Yoga, Ayurveda & Wellness Exhibition - The Yogshala Expo 2016 Hall No 7, Pragati Maidan, New Delhi 21st – 23rd June, 2016. 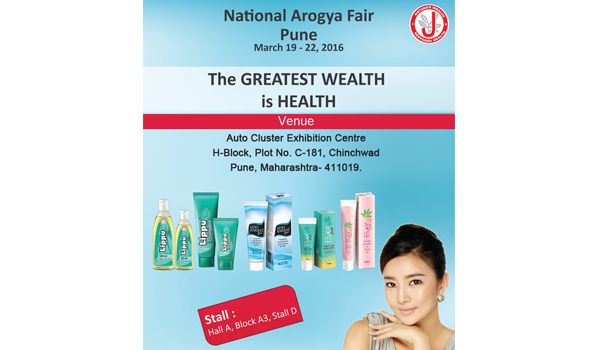 Don’t miss our Stall at the National Arogya fair, Pune. 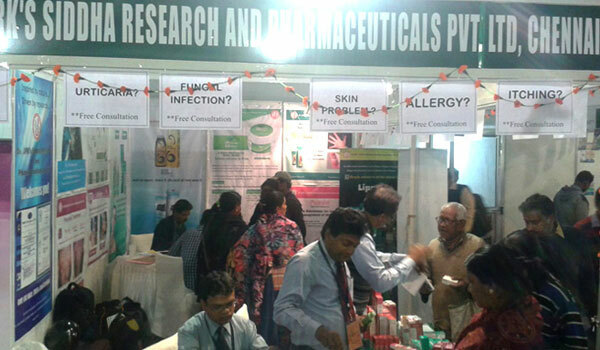 Many have already visited us to learn about our research products for PSORIASIS, VITILIGO, PIMPLES, DRY SKIN. 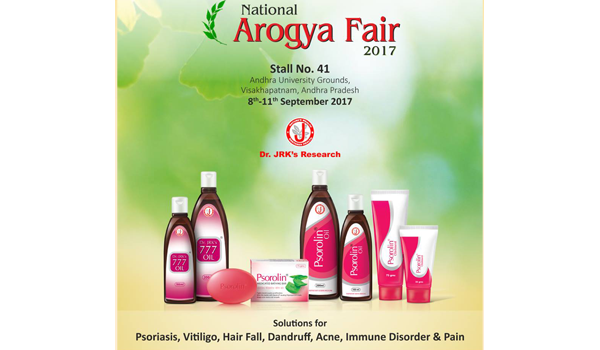 Visit us @ National Arogya Fair, Pune and get to know & experience some of the most researched herbal medicines for skin problems, hair fall and immune disorders. 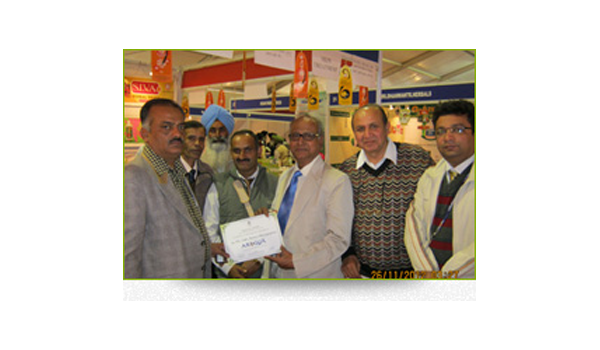 Dr.JRK’s Siddha received certificate from the AROGYA mela (Ambala) Organizers. 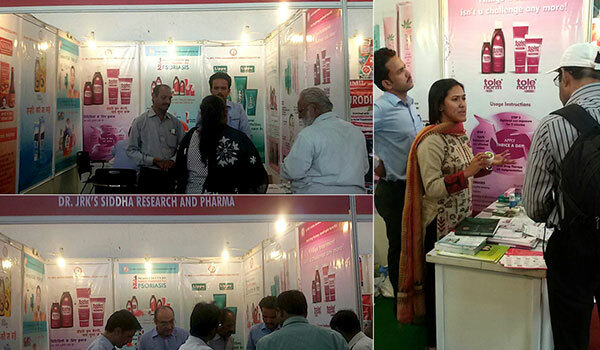 Mr.Vanit Joshi media advisor of CM visited our stall in AROGYA (Ambala) – March 2016. 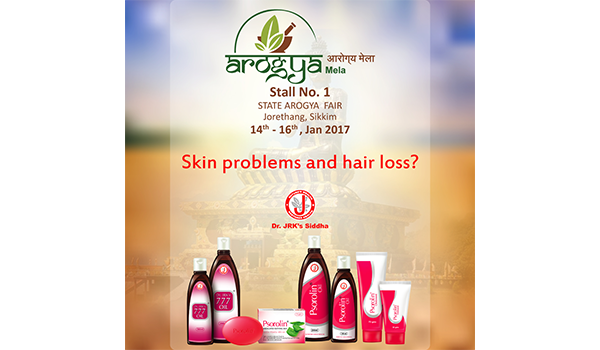 Visitors attended the Dr.JRK's Siddha stall and finding solutions for various skin problems at AROGYA mela, Ranchi, 12th - 15th February 2016. 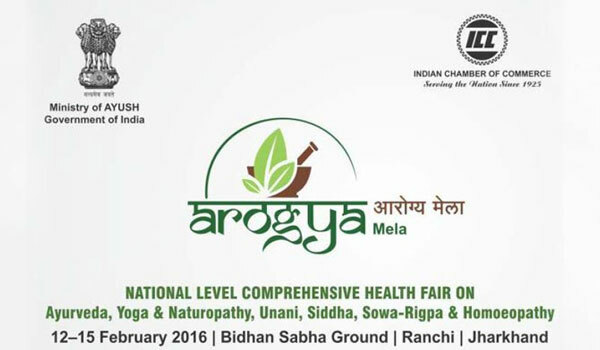 Venue: AROGYA mela, Ranchi. 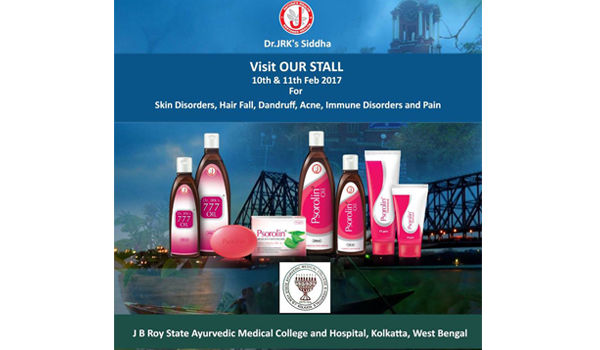 Visitors attended Dr.JRK’s stall and familiarizing with the holistic treatment approach of Dr. JRK’s Siddha in STATE AROGYA FAIR on 22nd January 2016, AGARTALA, India. 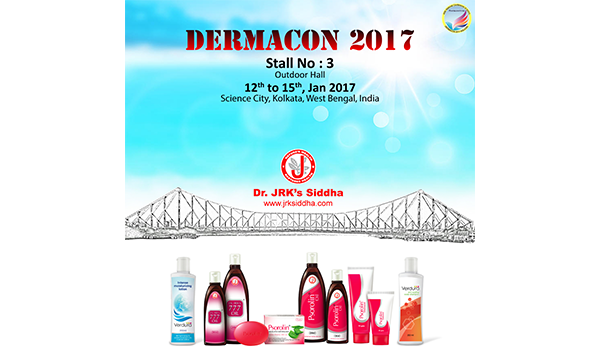 Venue: Nazrul kalakhetra, Agartala, Tripura. 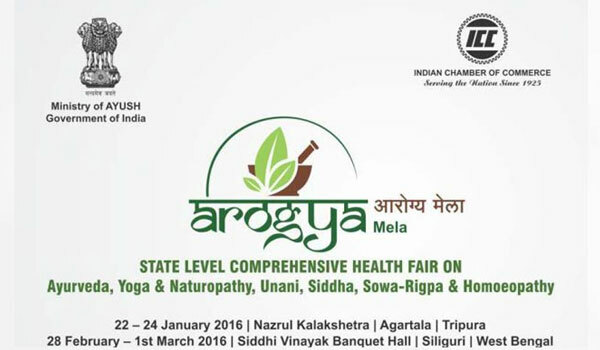 Come, join us at STATE AROGYA FAIR, 22 th -24th January 2016, AGARTALA, India. 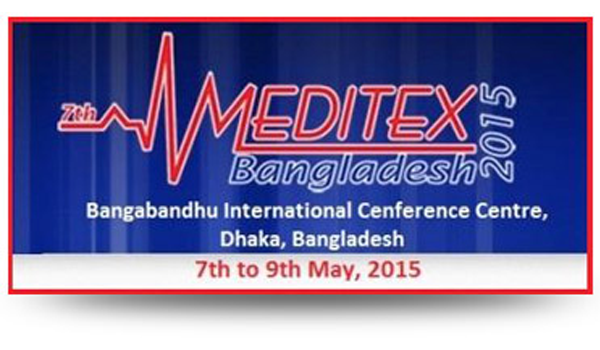 Venue: Nazrul kalakhetra, Agartala, Tripura. 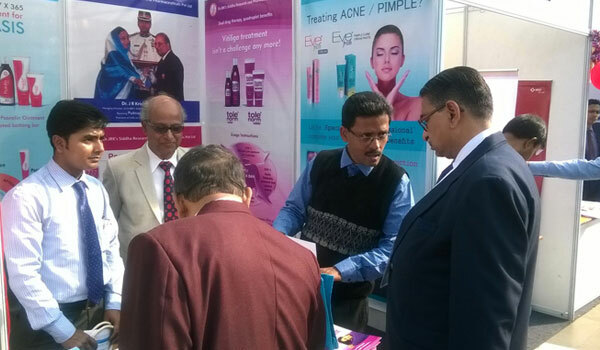 Leading dermatologists visited our stall in IJD DIAMONDCON-CUTICON WB-DERMAZONE EAST 2015, Kolkata, India and listened to the details of our research products and showed interest. 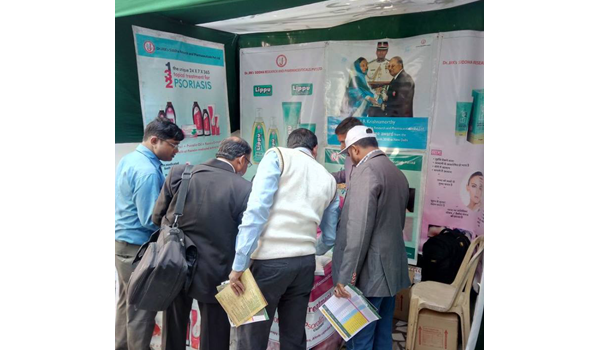 Shri - Shripad Yesso Naik Honb’le Minister of State (Independent Charge) for AYUSH visited our stall in AROGYA 2015 – 12th to 15th Varanasi, Utter Pradesh, India and keenly listening to our briefing and appreciated our research products. 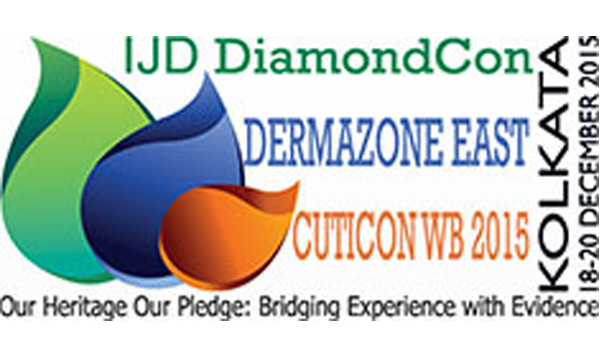 Visit us at IJD DIAMONDCON-CUTICON WB-DERMAZONE EAST 2015 -18th to 20th December at Swabhumi, The Heritage Plaza, Kolkata, India. 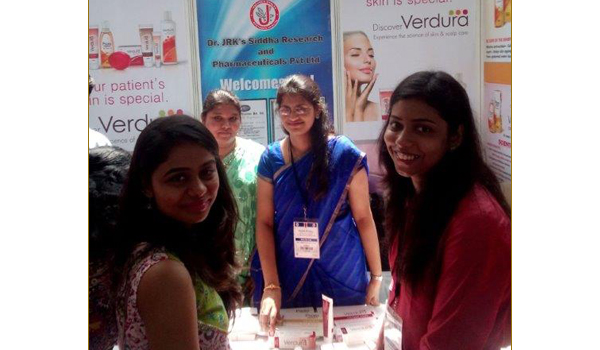 Dr. JRK's Siddha introduces VERDURA range of specialty cosmetics to Dermatologists. 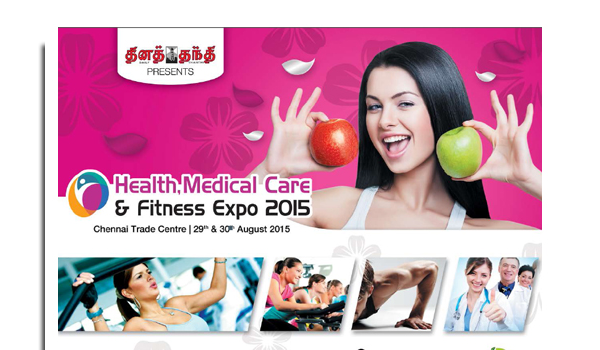 Visit us at Health Medical care & fitness expo 2015 – 29th and 30th August 2015, Chennai Trade Center, Chennai, Tamil Nadu ,India. 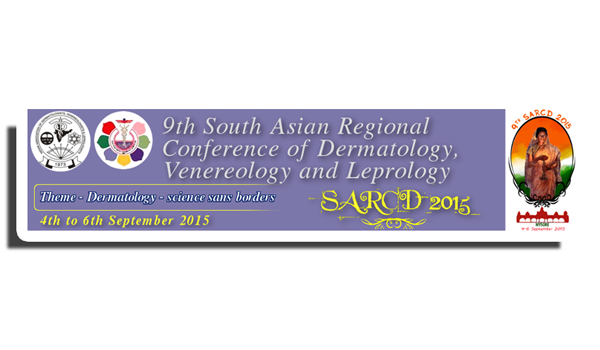 Visit us at SARCD 2015 – 9th South Asian Regional Conference of Dermatology 4th -6th September 2015 , JSS Medical College, Mysore, Karnataka, India. 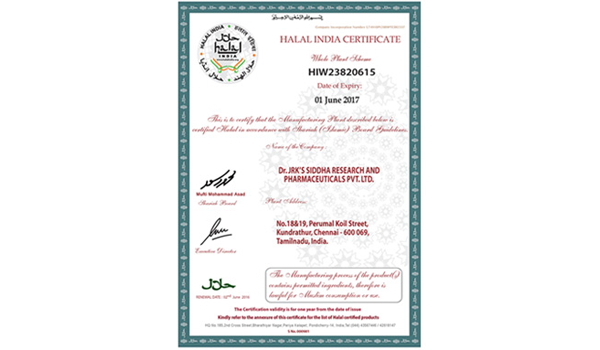 Dr. JRK’s Siddha Research and Pharmaceuticals Pvt Ltd, Chennai has received HALAL certification for its entire plant and the products manufactured by it. The certification is another important milestone in the efforts of the company to make its products globally relevant and accepted. 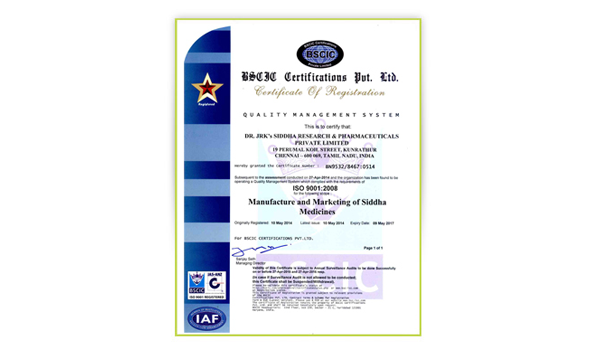 The certification also re-assures the patients , customers and medical practitioners about the stringent quality and process controls adopted by the company right across the value chain from raw materials to finished goods. 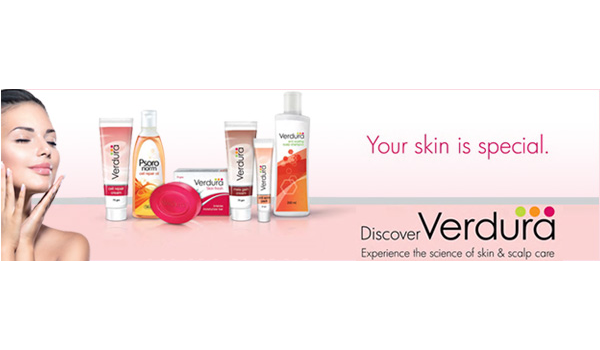 Dr JRK's Siddha Research and Pharmaceuticals Pvt Ltd - introduces a range of cosmetics with special benefits for skin care and hair care under the umbrella brand - VERDURA. VERDURA range unites the best of unique herbal active ingredients and some of the latest & globally recognized cosmetic ingredients. 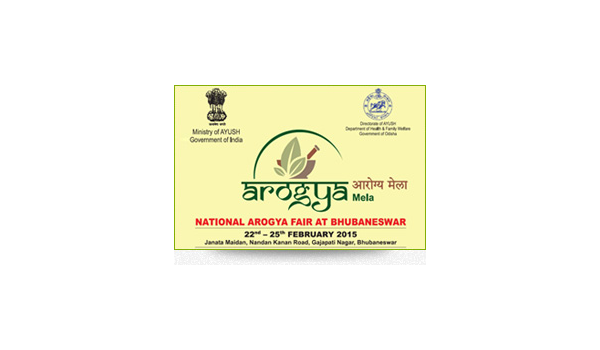 Dr. JRK's Siddha participated in ‘National Arogya fair at Bhubaneswar’ between 22nd and the 25th of Feb 2015 at Janata Maidan, Bhubaneswar, Odisha. 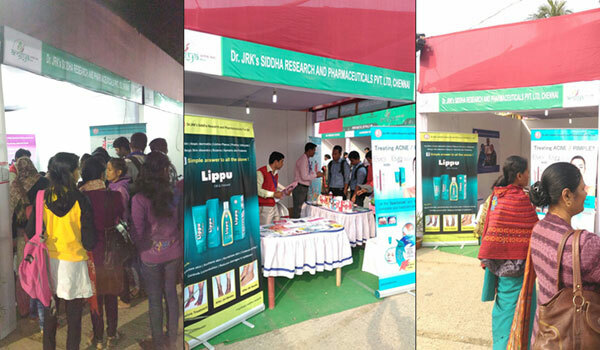 Dr. JRK's Siddha participated in National Arogya Fair 2015,Guwahati, Assam,India between 30th January and 2nd February 2015. 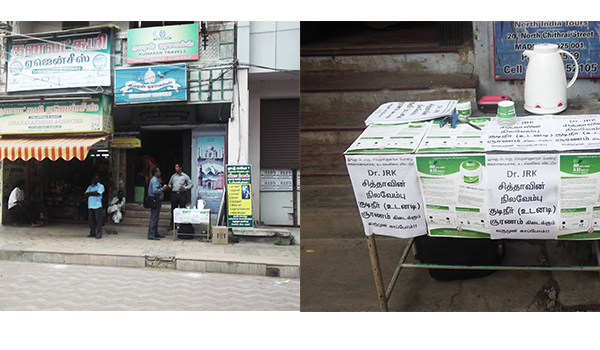 Dr. JRK’s Siddha participated in Siddham 50 Golden Jubilee Celebration – Tirunelveli, Tamil nadu, India - Jan 23rd -26th 2015. 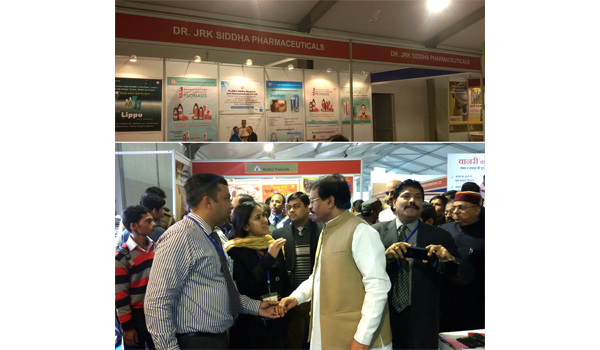 Dr. JRK’s SIDDHA participated in Ayush Pavilion – Vibrant Gujarat Global Trade Show & Pravasi Bharatiya Divas 2015, Gujarat, India between 7th January and 13th January 2015. 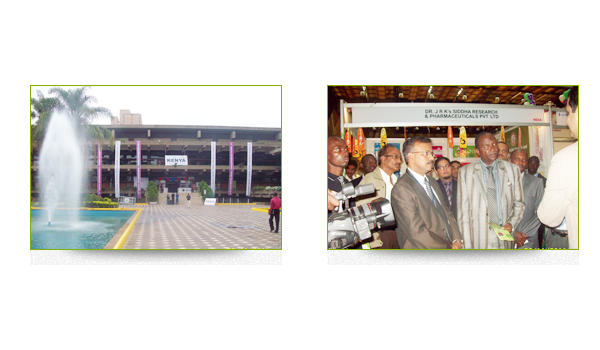 Izmir International Exhibition, Izmir, Turkey 29th of August to 02nd of September 2014. 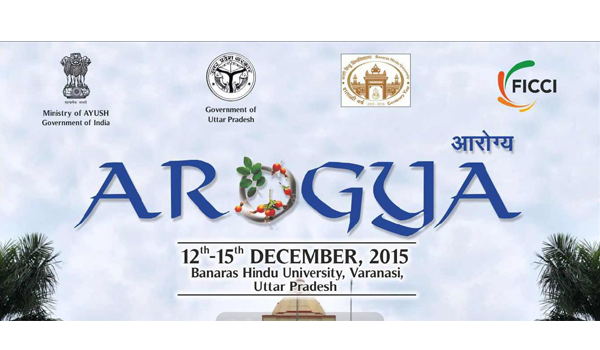 Lucknow Arogya 12th to 15th of November 2013. 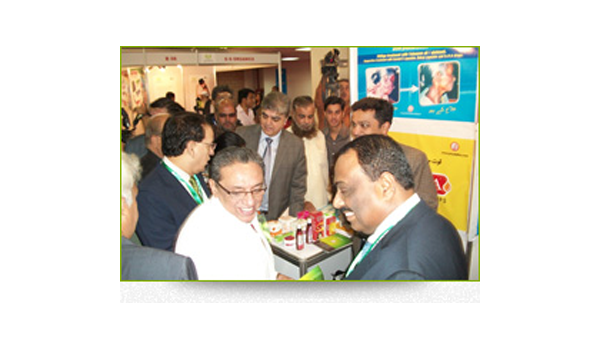 India Expo, Karachi, Pakistan - 21st of December to 23rd of December 2012. 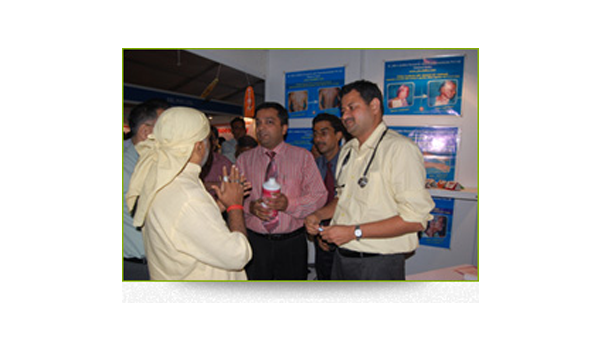 Anandpur Sahib (Punjab) Arogya, 23rd to 26th of November 2012. The Times of India and FICCI, along with The Ministry of Health & Family Welfare, Government of Tamil Nadu, have recognized Dr J R Krishnamoorthy- Managing Director and the company Dr JRK's Siddha Research and Pharmaceuticals Private Limited, with the launch of a Coffee Table Book titled "Pioneers" - Tracing the Success Story of Tamil Nadu Healthcare. 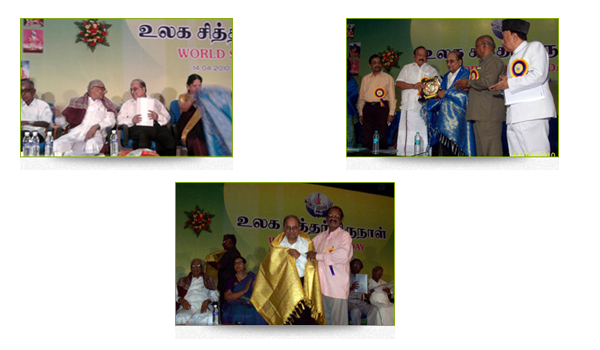 The book was released in the inaugural session of TANCARE 2012 on April 4th, 2012 at the Sheraton Park Hotel & Towers , Chennai. 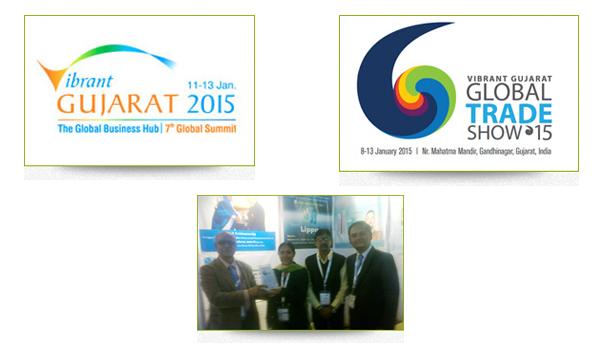 The organizers felicitated the company officials with a certificate and a glittering Award plate. The same was given by the High Commissioner of the UK in Chennai. The Growth of the company since its inception, its unique distinctions and pictures of its manufacturing facility and its operations / research / lab teams have been published. 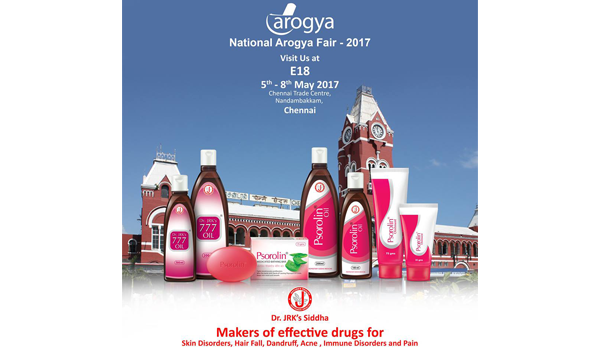 The company has found a place amongst some of the leading Pharmaceutical Companies in Tamil Nadu that have also been featured in this book. 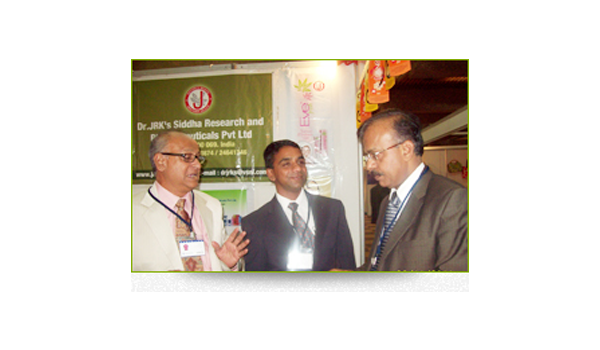 The study in question, conducted for Dr JRK's Siddha Research and Pharmaceuticals Pvt Ltd, investigates the claims made by the ancient Indian medical practice, the Siddha system of medicine, for the unique hair growth promoting properties of several medicinal plants. The effect of a study gel containing extracts from these plants was examined and compared in its effectiveness with a 2% Minodixil formulation in an experimental animal model. The results of this study allow several interesting conclusions to be drawn. 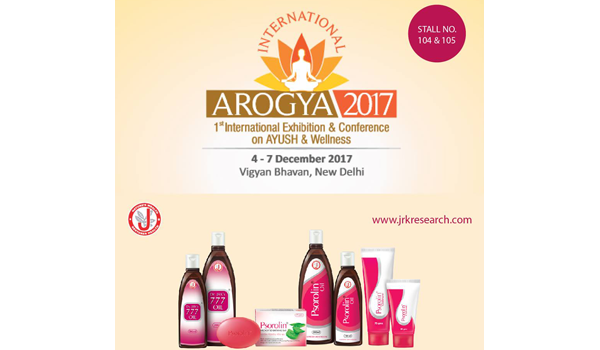 Most obviously, they reveal that the study formulation gel has a positive effect on hair growth that is comparable with a 2% Minoxidil application. 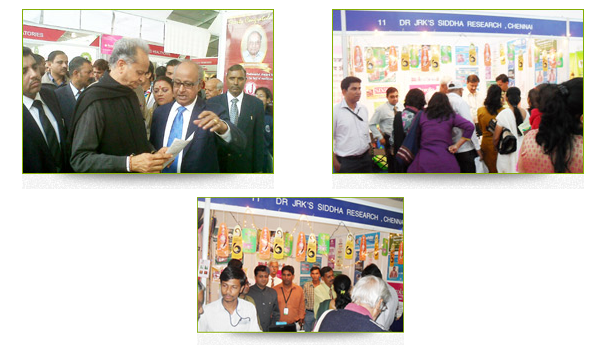 Mr. Subrata Som, Head-Business Development, Dr.JRK's Siddha Research and Pharmaceuticals is briefing about our research activity and the products to Rajasthan Chief Minister Shri.Ashok Gehlot at Jaipur Arogya Mela, which was held in - January 2012. 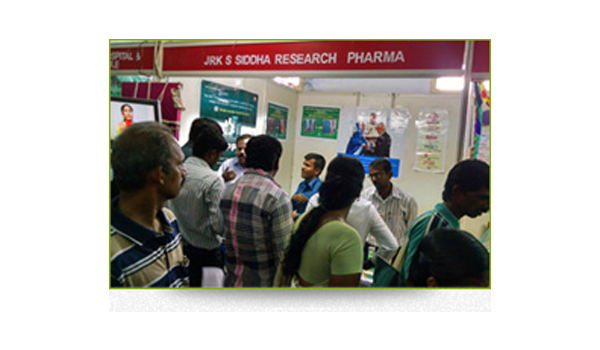 Dr. JRK's Siddha Research and Pharmaceuticals, has participated in 15th Kenya International Trade Exhibition held at the Kenyatta Intl. Conference Centre, Harambee Avenue, Nairobi, Kenya from - November 26-28, 2011. Shri. H.S. Mathews, First Secretary, High Commission of India, Nairobi, Kenya visited our stall and keenly listening to our briefing and appreciated our research products. Dr. J.R.Krishnamoorthy ( Jalakantapuram Ramaswamy Krishnamoorthy) on being conferred with Padma Shri ( India's top civilian award and recognition) by the President of India for his contribution in the field of medicine. Padma awards for Medicine for the year 2010 have been announced and Delhi tops the list in medicine with six doctors from Delhi bagging this year's awards in that category. Padma Awards, India's highest civilian awards, are conferred in three categories, namely, Padma Vibhushan, Padma Bhushan and Padma Shri. The awards are given in all disciplines/ fields of activities, viz. art, social work, public affairs, science and engineering, trade and industry, medicine, literature and education, sports, civil service, etc. 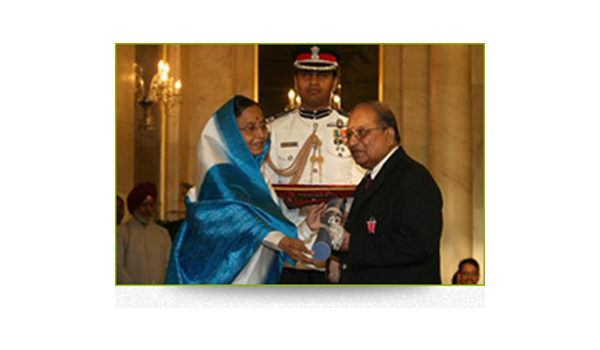 'Padma Vibhushan' is awarded for exceptional and distinguished service; 'Padma Bhushan' for distinguished service of high order and 'Padma Shri' for distinguished service in any field. The awards are announced on the occasion of Republic Day every year. The awards are conferred by the President of India at a function held at Rashtrapati Bhavan sometime around March/ April. This year the President has approved 130 awards including 13 in the category of Foreigners/ NRIs/ PIOs. These comprise 6 Padma Vibhushan, 43 Padma Bhushan and 81 Padma Shri awards. There are 17 ladies among the awardees this year. 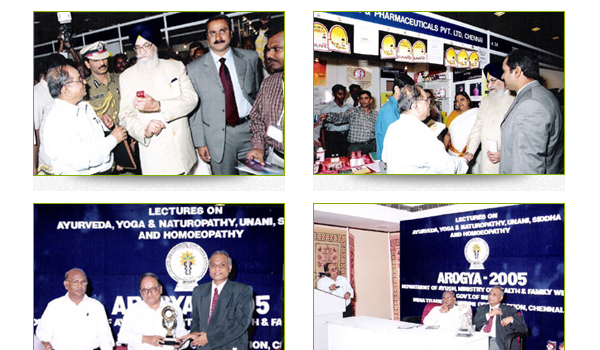 For the first time, the Arogya fair conducted by CCRAS (Central Council for Research in Ayurveda and Siddha) and Govt of India ( AYUSH ) was held on 7-9 Jan , 2005 at Chennai Trade Center, Nandambakkam , Chennai. 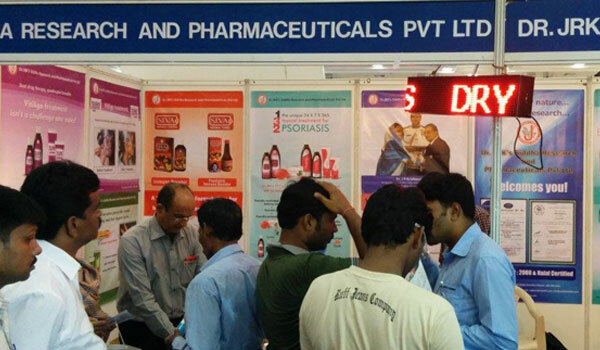 It was truly a great experience for Chennaites in this great congregation of people, came from different walks of herbal industry - Ayurveda, Siddha Doctors, Distributors, Reputed Companies, Consumers interested in herbal cure. 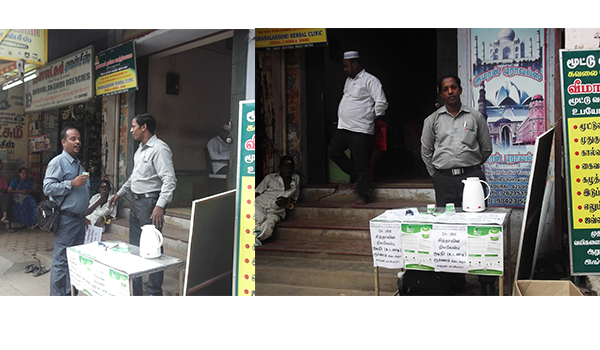 There was free treatment camp where doctors from different branches of herbal treatments - Ayurveda , Siddha , Unani , Naturopathy advised patients for their health problems. 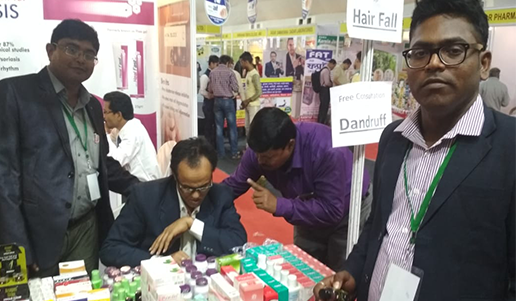 The three days fair created lot of enthusiasm amongst visitors indeed as there was for the first time a herbal fair of such big magnitude. 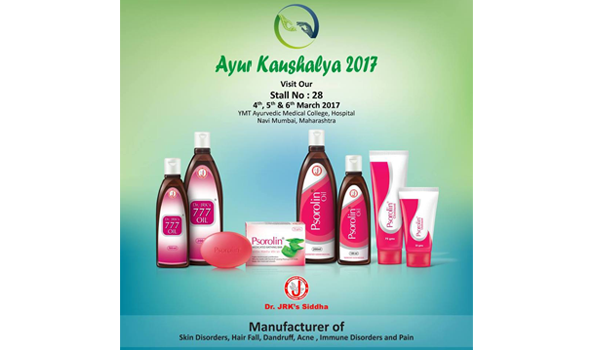 There lies the success of this fair when it was able to build a great deal of awareness on Indian System of Medicine amongst visitors. 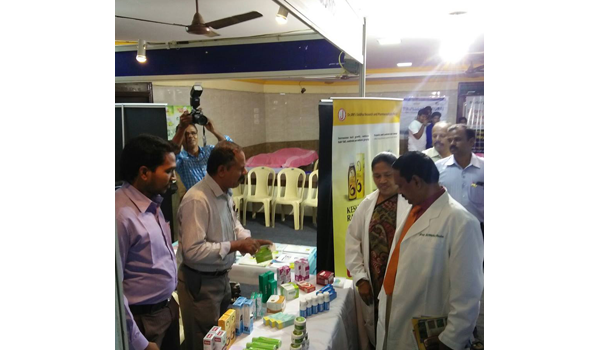 The fair was inaugurated by the Honorable Governor of Tamilnadu , Mr.Surjit Singh Barnala in presence of Dr. Anbumani Ramadoss, the Union Health Minister , Govt. of India.. Both of them in their respective speeches stress upon the importance of revival of Indian System of Medicine in a scenario where Modern System of Medicine is causing side effects on human body. 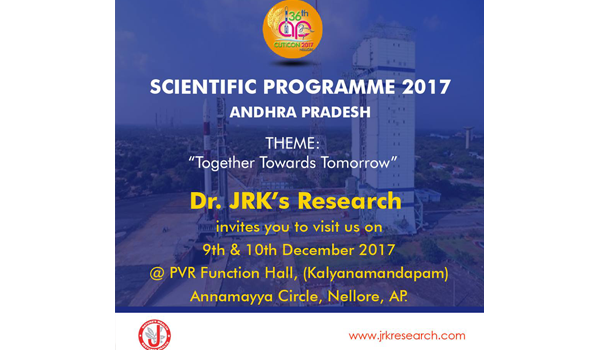 Both the Governor and the Union Health Minister visited the stall of Dr.JRK's Siddha Research and Pharmaceuticals (P) Ltd. and went through the documents of research and clinical trials. 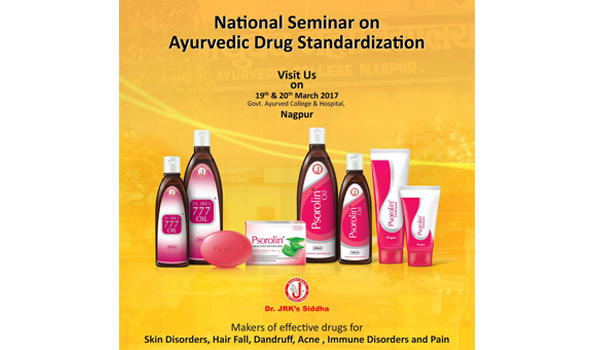 They praised our sincere endeavour on active documentation of clinical trials report and Research facts which is actually not amongst Indian Herbal Medicine Companies. In this rare opportunity, we highlighted and demonstrated better efficacy of Indian system of Medicine vis a vis Modern Medicine, specially in case of Chronic diseases of global nature. 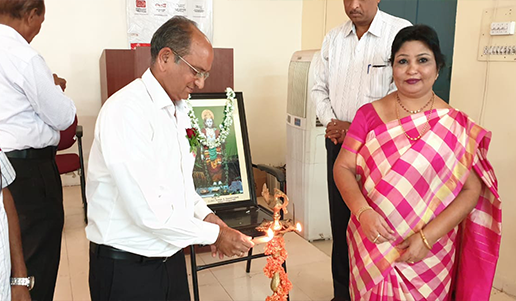 Dr.J.R.Krishnamoorthy, the Managing Director of the company himself delivered a well thought out lecture on importance of Indian System of Medicine in global arena and the context of fast acceptance of Indian Herbal Medicine by Western Countries. Overall, it was a great show for both the Company and the Organizers.